When selecting IsPixelBased in true, the elements are scrolled smoothly, but a lot of them begin to lag. And the worst thing is that sometimes the application crashes with StackOverflowException. 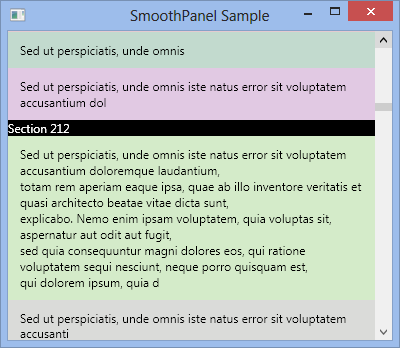 The crash is caused by the code in the VirtualizingStackPanel.MeasureOverrideImpl method, where the tail call is used, and the call depth is not limited by any means. In addition, we wanted to display elements of different types (reviews and comments) in the list. It can be solved by the usage of TreeView instead of ItemsControl and by specifying several HierarchicalDataTemplates. But the above-mentioned problems still persist. Afterwards, we decided to reinvent the wheel to make it work smoothly. Scroll thumb should not change in size while scrolling. The option to set up a separate template for each element type should present. Problems occur because the element size can’t be accurately deduced before its creation. And, to make scrollbar display everything correctly, ALL elements should be created, what contradicts with the virtualization principle and affects productivity. So, what can we do? 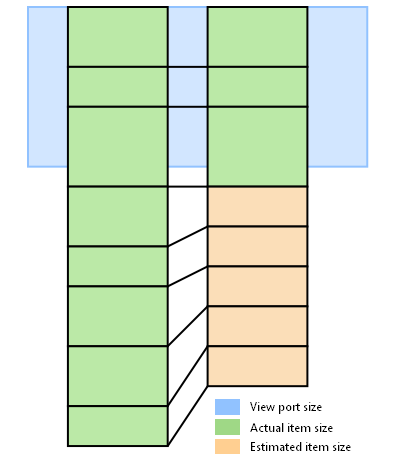 If scrollbar displays the estimated height of the objects instead of the real one, then the height is not a subject to change after creation (when elements appear in scope) and deletion (when elements go beyond the scope and we cannot get the real height). In other words, scrollbar will work in its own supposed units, meanwhile the elements in scope start to recount their location in proportion to their real size. Basically, we can set the similar estimated height for all elements. It will affect only elements’ steadiness during scrolling, and, if the size of the elements does not differ drastically, it will be unnoticeable. The first attempt to implement these ideas showed that there are additional aspects to be taken into account. Firstly, when we scroll down the list to the very end, the elements may not reach the bottom of the list or go beyond it. Of course, we could use a quick-and-dirty workaround, but instead we decided to create several elements at the top of the list, which collectively cover the scope. We will use the real height for these elements. The following image illustrates the aforesaid approach. Secondly, right after creation, the recreated elements do not contain all the data, that is attached afterwards with help of data binding. The Dispatcher usage is problematic, as you can’t break the MeasureOverride–ArrangeOverride chain for no reason. At this point, we had to use the hack and process the task queue of data binding manually. TextMeasurer includes the code, that roughly, but very quickly changes the size required for the text display. It is just an example, and you can use any other technique for evaluating element size. Tabbing to the elements, that have not been created yet. Very impressive approach. Thanks for this. one doubt though: what if I have fixed size items and I know their sizes already. can I make it more faster somehow? This is pretty cool, but would be great to have a version that uses the by default.